Marin Ćilić, the winner of the 2015 Moscow Tournament. Photo by TennisTV. Short overview of the match; 1:26. Marin Cilic has defeated Spain’s Roberto Bautista Agut in the Moscow final for a second consecutive year, 6-4, 6-4. The victory marks Cilic’s 14th career title and first of 2015. “This tournament is becoming more and more special for me. 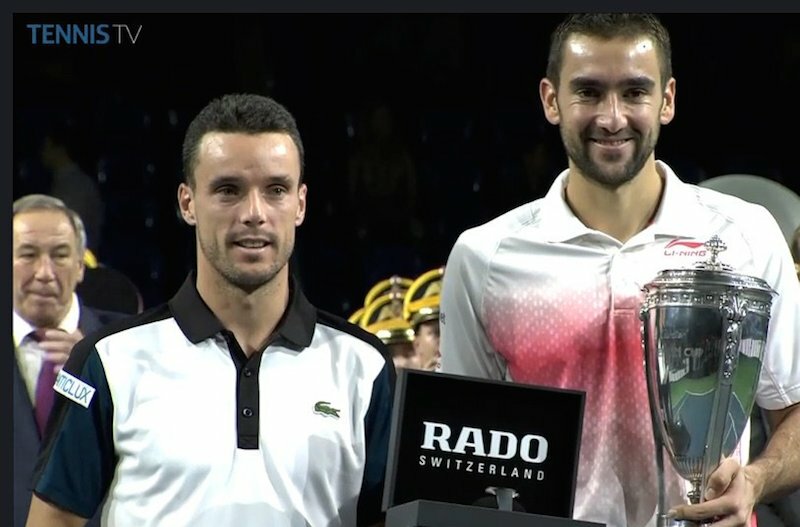 To win it again really gives me huge satisfaction and big pleasure,” Cilic told the Moscow crowd after the final. In a rematch of last year’s final very little separated the two combatants. Cilic saved all four break points he faced (two in each set) and made the most of his two break opportunities, converting each. The Croatian moved ahead in the first set, breaking to 15 when a Bautista Agut forehand clipped the tape and sailed wide of the tram. In the second set Cilic broke for 3-2 when a blistering forehand crosscourt eluded a net-rushing Bautista Agut. The Spaniard earned two more break points to level in the next game, but he erred on a forehand on the first and Cilic hammered a backhand winner on the second. Marin Ćilić of Croatia on the right and Roberto Bautista Agut of Spain. Photo by TennisTV. No. 1 seed and defending champion Marin Cilic needed just 77 minutes to eliminate Evgeny Donskoy 6-3, 6-1 and advance to the final of the Kremlin Cup by Bank of Moscow on Saturday. The Croat finished with 10 aces, won 80 per cent of first serve points and saved the lone break point faced. It was a first career ATP World Tour semi-final for the 25-year-old Donskoy. The wild card became the first Russian since 2011 to reach the final four in Moscow (Davydenko). Donskoy had not dropped a set en route to the semi-finals, but was broken at 3-4 after saving three break points and saw Cilic serve out the set in the following game. He swept the final six games of the match to advance to his first final of 2015 and remain in striking distance of a spot at the Barclays APT World Tour Finals. Currently 13th in the Emirates ATP Race To London, he could move to 11th by capturing the title. On Sunday, Cilic will take on No. 2 seed Roberto Bautista Agut, who downed fourth seed Philipp Kohlschreiber 6-4, 6-4 in 80 minutes, in a rematch of last year’s final. Bautista Agut is also through to his first final this season, having previously gone 0-5 in semi-finals. It will be the pair’s second FedEx ATP Head2Head meeting. Cilic prevailed 6-4, 6-4 in Moscow exactly 12 months ago. The final match between Marin Ćilić and Roberto Bautista Agut the preceding year, 2014, also in Moscow; 4:10.